Sophisticated, unique and created to stand out! 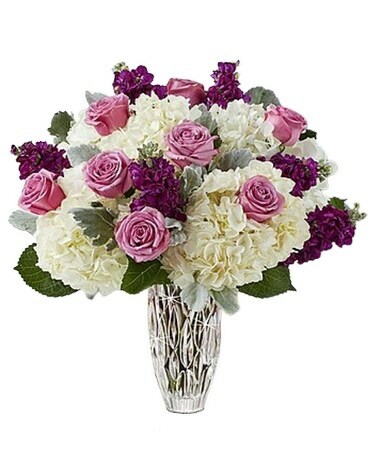 Here, a dense, colorful mixture of white hydrangeas, lavender roses and more arrives in a gorgeous vase of clear crystal from the Waterford Rainfall Collection, which features a design reminiscent of a tropical rain shower. It’s a one-of-a-kind gift that will add luxury to birthdays, anniversaries or “just because I love you” days.